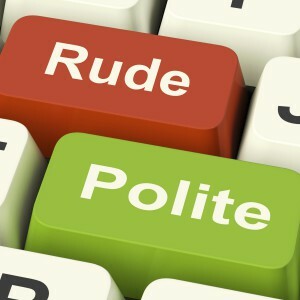 Over the years, you’ve been reading lots about workplace incivility in this blog. So, for a change, let’s pause to reflect on why civility matters in the first place. Consider the game of curling, where a stone has to make its way safely into a target area over a sheet of smooth ice. Two team members sweep the ice to allow the stone to move smoothly to its destination. Performance. People who are treated with respect are able to focus. Their mind is not bogged down by worry, their brain is not flooded with memory-impeding stress hormones, and their time is not spent on second-guessing whether or not the uncivil person intended to belittle or dismiss them. With focus, they perform at their best. Trust and teamwork. Respectful relationships yield trust, and trust in return makes people support each other, collaborate, hold themselves and one another accountable, be flexible, lend a helping hand, deal effectively with interpersonal problems, and work together toward shared goals. Customer service. The focus, trust and teamwork that civility brings about result in effective, smooth and cheerful service. Engagement and retention. Employees who feel that the organization treats them with respect and that its managers are actively ensuring that everyone is dealt with in a civil manner are highly invested in the success of the enterprise. They are less likely to depart prematurely. Innovation. Innovation relies on people’s sense of safety and trust. A civil work environment creates a milieu where new (and possibly unconventional) ideas can be shared and explored without fear. Health and safety. A civil work environment is a psychologically safe one. In a world of ever-growing rates of mental health illness on the job, a civil environment prevents the triggering or exacerbation of mental health problems (and the associated high levels of absenteeism and benefits costs). Furthermore, focused and calm employees are much less likely to engage in hazardous behaviour or be involved in workplace accidents. The advantages of upholding a civil work environment are almost common sense. And yet—have you noticed?—incivility continues to exist uninterrupted in most organizations. I like to keep my promises. I promised last time to keep you posted on news regarding our new civility accelerating tools. . . you can now take a sneak preview by clicking HERE. They are available at a time-limited launch price. Contact us anytime to talk about how these products can help transform your environment.